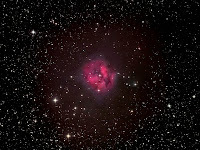 With the run of clear evenings continuing I made my first ever attempt at IC 5146 (The Cocoon Nebula). I got a good set of subs and enjoyed processing what must be one of the most attractive of the well known nebulae. Although the subs finally used were 10 minute exposures there seemed very little gain over some 8 minute exposures I tried initially. Details: 10" F 4.3 10x 10 minute exposures @iso800 with CLS in DSS , CS2 & XAT Image Optimiser.